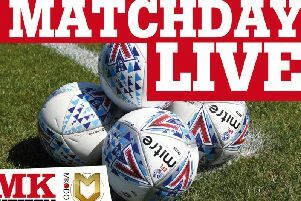 MK Dons waved goodbye to their League 2 title chances leaders Lincoln City claimed a 2-0 win at Stadium MK on Saturday. Ryan Harley upended Shay McCartan in the 34th minute, allowing Akinde to roll home the spot kick, before Bruno Andrade's strike in stoppage time secured the win in what was a thrilling encounter. The result, along with Mansfield's 1-0 win over Cambridge, means Dons drop to third on goal difference, while Lincoln now 11 clear with 15 points still on offer. For the table top clash, Paul Tisdale named an unchanged side from the one which started against Forest Green Rovers a week earlier. Lee Nicholls was making his 100th appearance for Dons in goal, while Kieran Agard was on 99 career goals heading into the clash. As expected, both sides started brightly and quickly, neither willing to let the other settle. Jordan Houghton forced the first save of the game when he tested Matt Gilks from range, while Russell Martin could not repeat his scoring exploits after last week's winner, heading Dean Lewington's corner wide. Lincoln looked dangerous going forwards, but did little to trouble Nicholls, though were gifted the opener on 34 minutes. Ryan Harley's needless challenge on Shay McCartan gave referee Kevin Johnson no choice but to away a penalty, which was duly slotted home by John Akinde. It could have been worse for Dons five minutes later when Harry Anderson shrugged off Lewington's attentions, only to see his cross put just past the post by Joe Walsh. With the game looking like following a similar path in the second period, Chuks Aneke was introduced to the fray 10 minutes after the restart, and it brought an added edge to the affair as he immediately set about riling the Lincoln defence. In fact though it was three of the game's more deminutive figures - Conor McGrandles, Jake Hesketh and Tom Pett - who caused tempters to flare when the Lincoln man hacked away at Hesketh after the whistle, prompting McGrandles to take exception with a shove, sparking both sides and benches into a scrum. Dons were certainly the side in the ascendency in the second period as Lincoln defended their lead, but despite their pressure, seldom forced Gilks into anything meaningful until stoppage time when Aneke almost drew Dons level. From there though, Lincoln rushed up the pitch, finding Andrade on the edge of the box to bend home a wonderful second to wrap it up.